WordPress powers around 30% of the internet. It’s so popular because it’s free and easy to use. However, being such a massive open source Content Management System makes it prone to a wide range of attacks and exploits. This is why backing up your WordPress site is super important! You can never have too many backups. 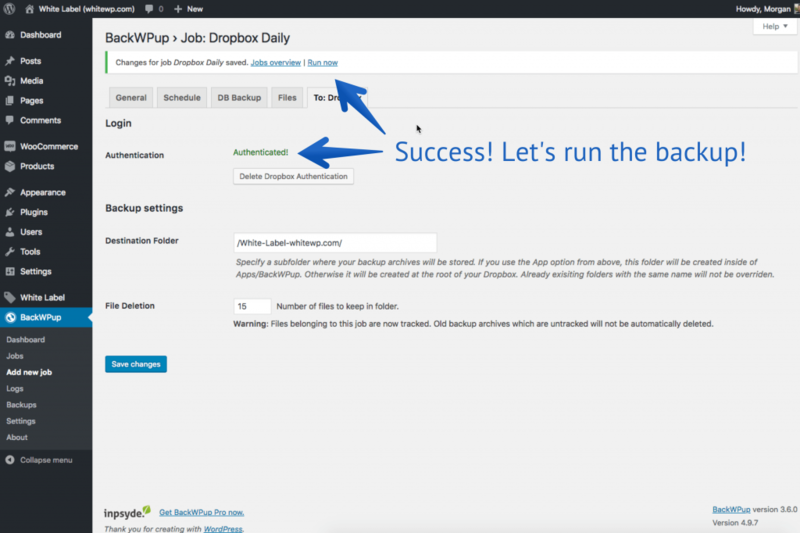 We backup most of our WordPress sites to Dropbox daily, and it works super well! We’ve tried and tested a lot of backup plugins to find the best one. We love what the team behind BackWPup is doing. Their free plugin has scheduled database and file backups. You can also selectively back up your plugins here. 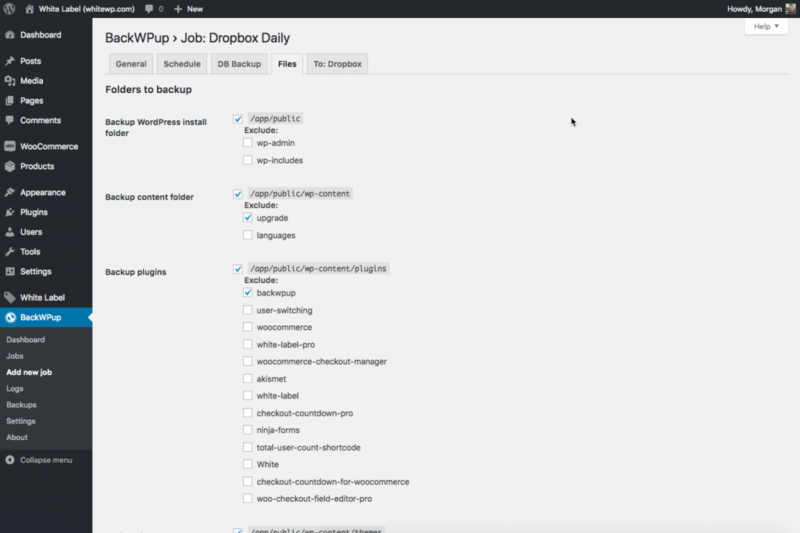 Basically, you can backup your complete WordPress site. 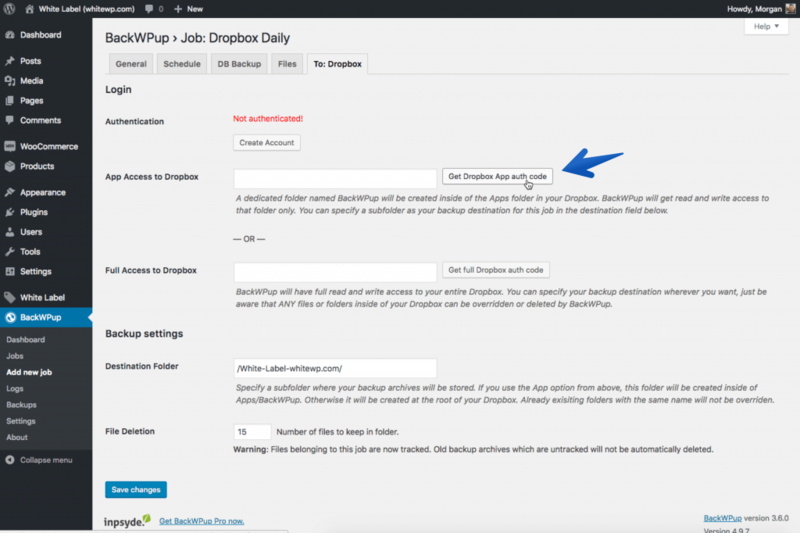 The plugin allows backups up to multiple locations, such as to the server, FTP, S3 and our favourite, Dropbox. 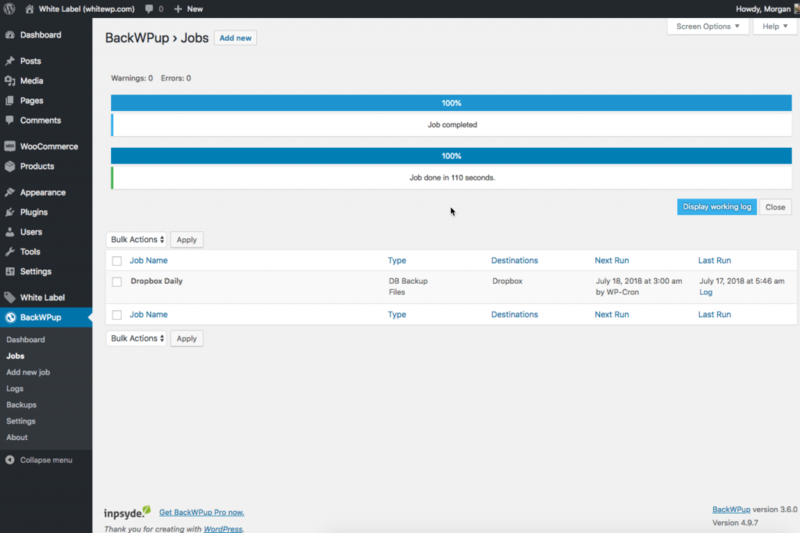 As a side note, the plugin’s name reads as Back-WP-Up (Back WordPress Up), not Back W Pup! Let’s go over the short version first. We’ll go over the settings in more detail with screenshots below. Now let’s go over the full setup. The first step is to install BackWPup, don’t worry it’s free! Look at the admin sidebar go to Plugins and then Add New. Search for BackWPup and hit the ‘install now’ button and then activate. You will now be greeted by a few messages from the team. You can skip that for now and head over to ‘add new job’ in the sidebar. There are a few things we need to set here. Let’s get started with giving our backup a name. One easy way to name this is with your backup location and schedule, such as ‘Dropbox Daily’. The archive name is the name of the compressed backup file which contains your website and everything else you’ve selected. Date shortcodes are added by default. They will automatically put the date of your backup in the name of the compressed file. You can name it however you want. We’ll add ‘test_’ to front of ours so we can easily tell backups apart. Next we will select which format to use for our backup. We prefer .zip files because they’re easy to deal with and we’re able to import the whole site into Local by Flywheel which we use for our local development. The next step is to choose the backup destination, this is where we select Dropbox! You can add multiple destinations if you wish. If you choose the folder destination, then a backup will be stored on the website server as well. 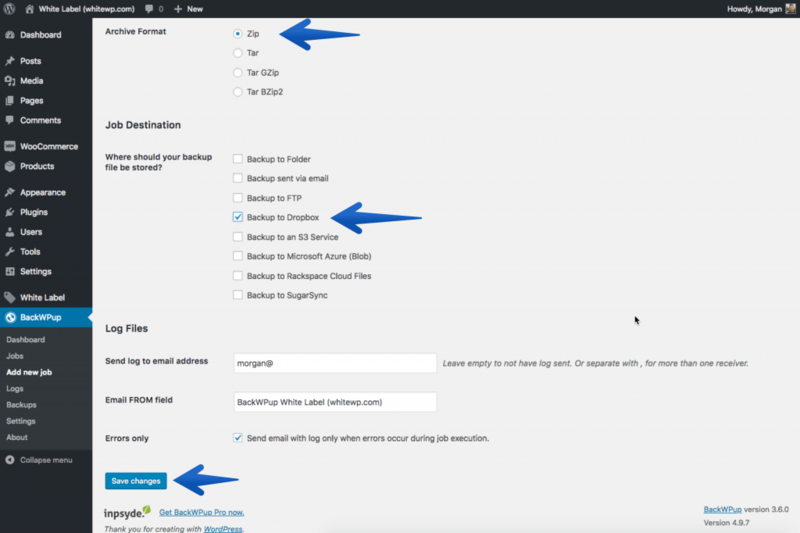 Want email notifications if backups fail? There’s not much to explain there. Click save! The schedule tab allows us to select how often the backup should run automatically, or we can choose to do this manually. We use WP-Cron and have it to backing up daily at 3am. 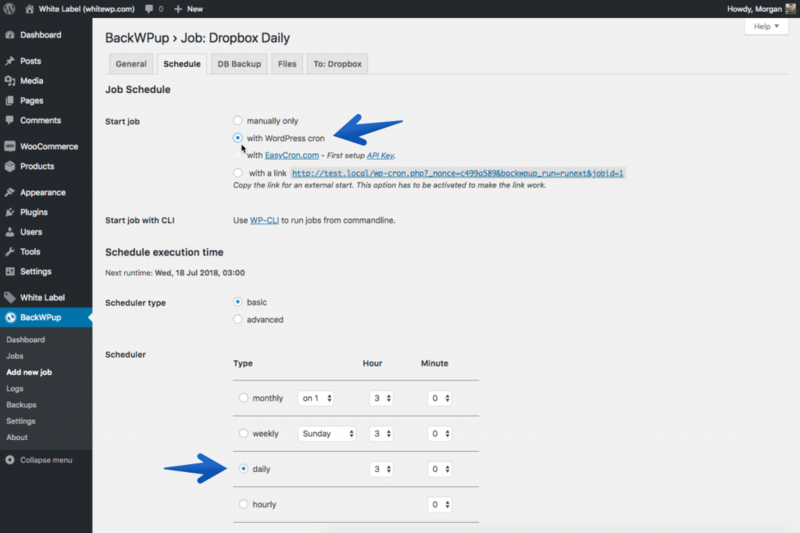 WP-Cron which is WordPress’s default scheduler, and doesn’t need further installation like the easycron.com option. We leave all of the database tables selected for a full backup. We recommend you do the same unless you are familiar with the WordPress database structure. Your Database will be backed up and compressed with the rest of your files. You can change the name of the database file and further compress it if you think you have a large one. The files tab is much like the database options. You can specify which folders, files or plugins to include in the backup. The defaults are set for the most common use. Time to authenticate our Dropbox account! It’s simple and straightforward. We prefer using the the first option “App Access to Dropbox”. Basically, BackWPup will only have access to one folder in your account. Click ‘Get Dropbox App auth code’ and you will be asked to login. 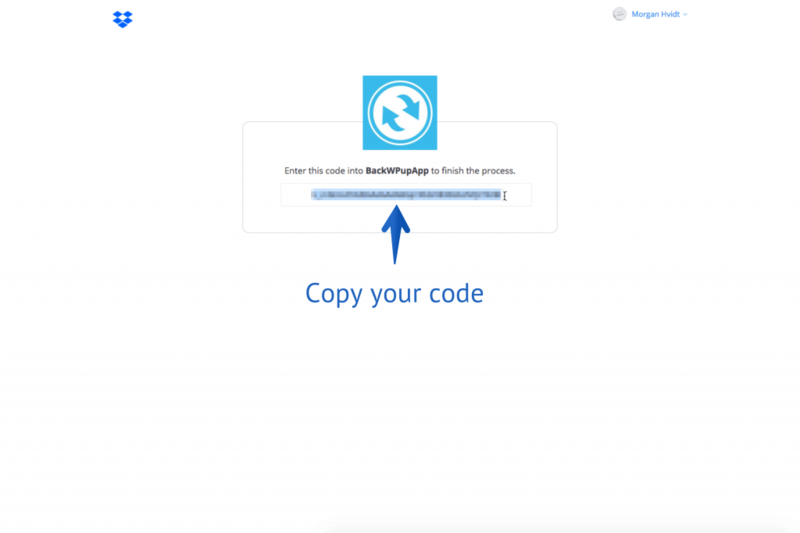 Once you’re logged in, simply copy the code on the screen and head back to the settings to paste the code. 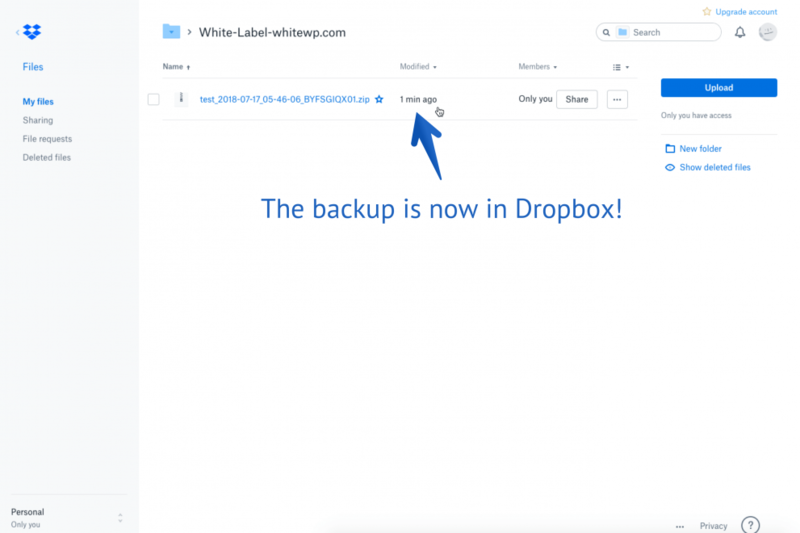 The file deletions will make sure that your Dropbox storage doesn’t go over the limit. You can set exactly how many versions you want to keep. The plugin will automatically delete the oldest if the limit is reached. Hit save! 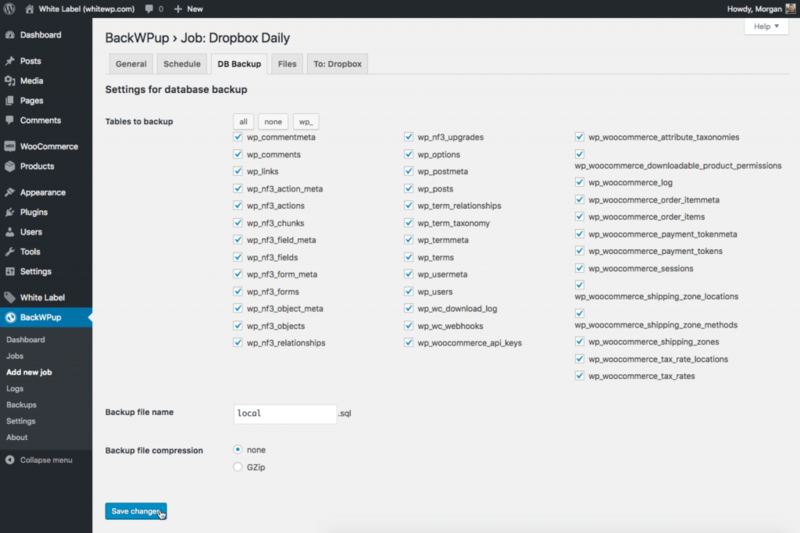 Now we have successfully set our WordPress files and database to backup daily into our Dropbox account. Let’s try to run the backup manually. We can do this from the notice banner or from the ‘jobs’ menu anytime. We can follow the process bar to make sure everything runs smoothly. It’s done! Here you can see our completed backup file in Dropbox. We do recommend storing your backups in more than one place so you are extra secure. 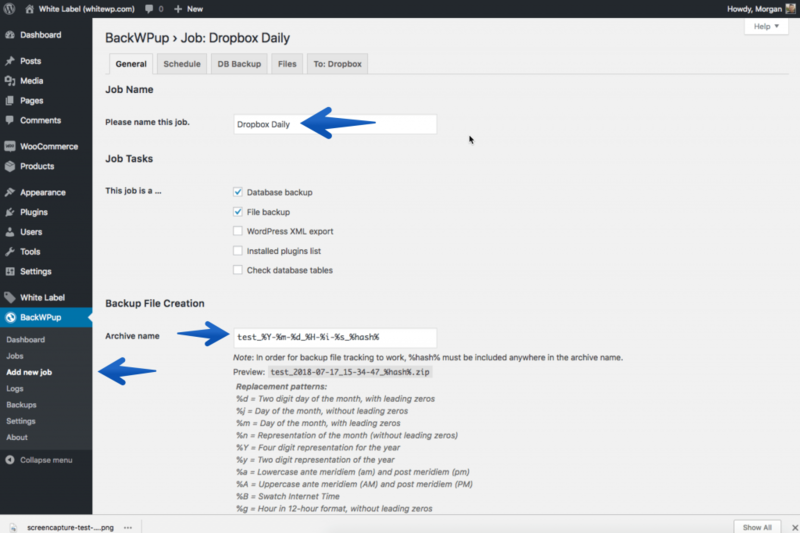 Need a new Dropbox account for work? Then sign up here. We hope this guide has been helpful. Comment below and let us know what your favourite backup options are! Previous Previous post: Should I Rebrand WordPress for Clients and How?